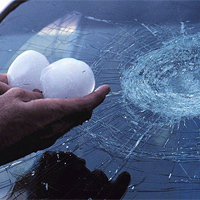 Richard Green, National Director of the South African Motor Body Repairer’s Association (SAMBRA), a constituent association of the Retail Motor Industry Organisation (RMI), says his outlets always experience a flood of inquiries from concerned motorists after hailstorms such as this one. “Depending on the depth of the dent left by the hailstone, the dents can be removed by a process known as PDR or paint-less dent removal,” says Green. This process utilizes trained professionals and involves specialized tooling which accesses the metal panels from the inside and manipulates the dent until it is completely repaired. Green says this method is used internationally by insurers. “The only cautionary note here,” he says, “is that horizontal panels, such as your roof, bonnet and boot may have been subjected to so many hailstones that removing them using the PDR method may stretch the metal and in cases such as these the panel may need to be replaced.